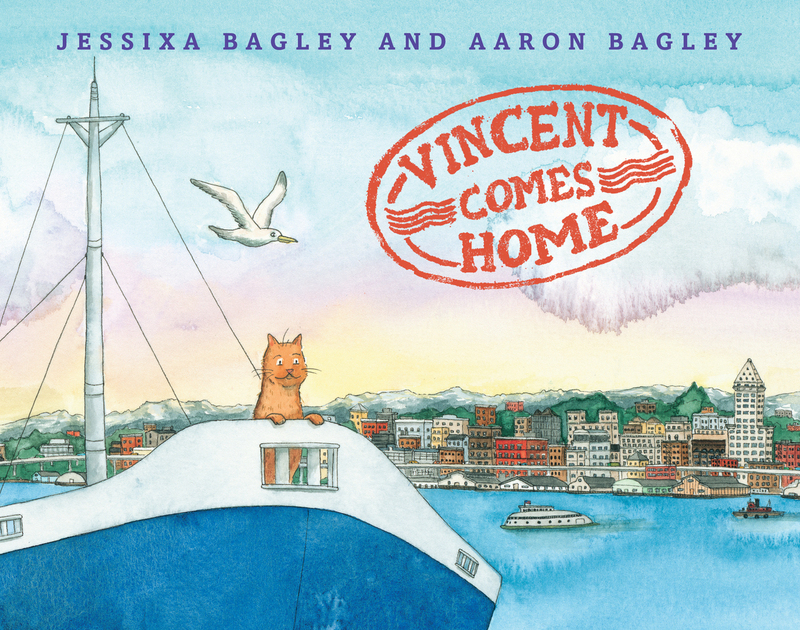 I know we have many fans of Jessixa Bagley’s books around here (see this post and this one), so I’m thrilled to have Jessixa and her husband and collaborator Aaron Bagley visit us to chat about their recent book Vincent Comes Home (Roaring Brook Press)—and, well, lots of other good stuff. LA: I imagine two creative people—with a young son for extra inspiration—pitching ideas to each other all day long. Yet this is your first book together. How did it come about? JX—Aaron and I never stop talking (I’m sure that’s why our son is a chatterbox), but a lot of what we talk about centers around ideas and inspiration. I feel like I’m always throwing book ideas out to Aaron and he’s always working on a drawing or something. It’s just woven into our day in a very organic way. 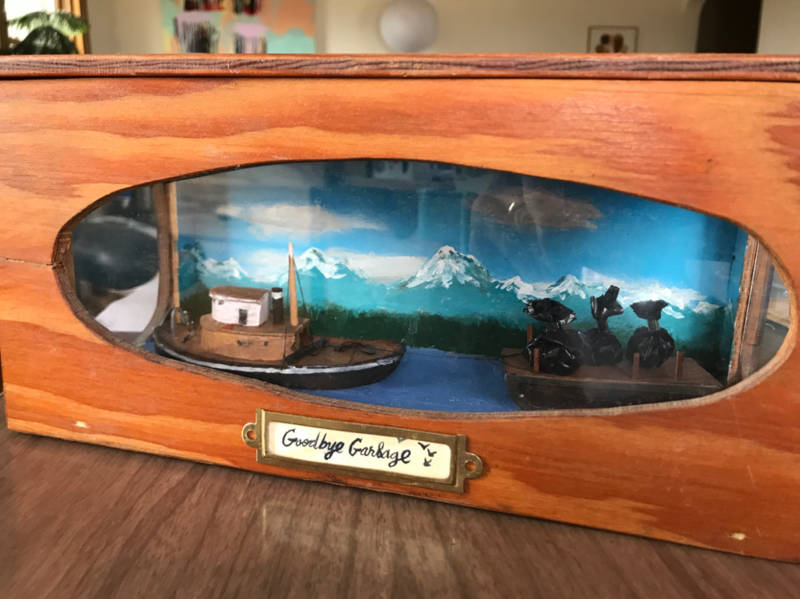 Vincent came about from a combination of the view from our apartment (we could see the barges coming and going), our cat Vincent, and a diorama we jointly made of a little garbage scow. 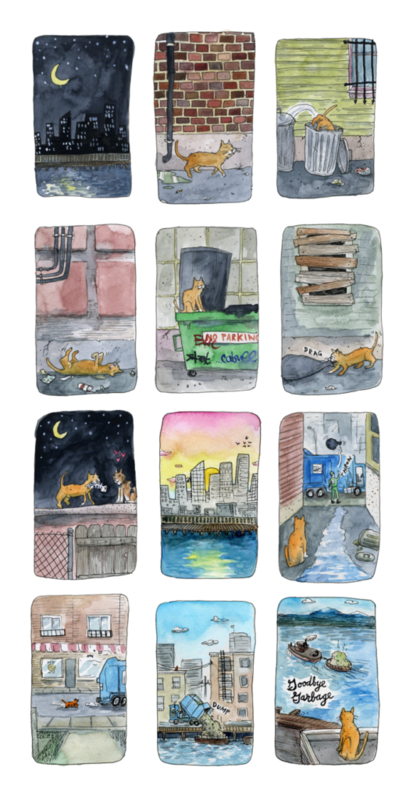 AARON—I liked the diorama so much I made a mini-comic about a stray cat who loves garbage. Later I worked it into a full picture book and Jessixa and I reworked it for Vincent Comes Home. The idea stuck because it was born out of our home, and cultivated together. It’s Aaron and Jessixa to the core. LA: What’s it like working together? JX—We’ve always made art together even when we were first dating so it’s very organic. Aaron proposed to me at our first joint art show that we had. We go through spurts of making our own art, then feeling the need to come together to make a joint project. We get anxious if we haven’t made something together after a while. And my favorite thing is that we actually work really well together. We don’t really argue or disagree—I know that’s not what people want to hear, but it’s genuinely true! The only times we really ever have disagreements with each other is when giving directions in the car. For me working with Aaron is great. He has amazing instincts, see things that I wouldn’t see, and he always teaches me by example to be free and less controlling in my work. 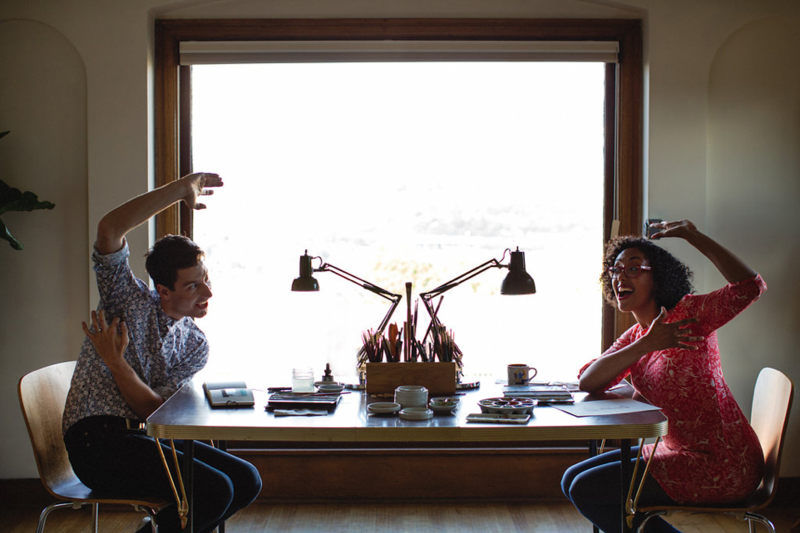 He’s the Oscar to my Felix when it comes to art—in a good way! For Vincent Comes Home, we made it how we make all of our art—we just trade back and forth. We both wrote the book and illustrated it in equal parts. The art was fun because we each only owned one or two things, purely for consistency sake (Aaron did all the sky and water and I did the Domus), but everything else we just would both work on. Each painting was penciled, inked, and water colored by both of us alternating elements. It oddly makes it more consistent that way. AARON—We have different work habits. Jessixa works in the evening and I prefer mornings and afternoon. My palette is a mess and Jessixa’s is tidy. We both adapted to each other’s preferred methods – picking out the strengths in each person’s ways and going with that instead of letting our bad habits be obstacles. LA: Jessixa, Vincent is your first book with humans in it. Do you two have preferences when it comes to featuring human vs. animal characters? JX—I really love books with animals. I just respond to them more. Probably because I rarely ever saw characters that looked like me depicted in picture books when I was a kid. I connected more to animals because the focus on animal books is the content of their character and their experiences. Oddly, to me animals have more personality sometimes than people sometimes do! Plus they are pretty cute. So for Vincent Comes Home, I made Aaron take the lead on drawing the people. I was involved some, but they are mostly him. He loves drawing people and accentuating their weirdness. My next book though is all people! Ack! There is like a cow and some ducks and a hen as just decorative elements on a couple of pages, but other than that, it’s all kids! It was pretty daunting. I didn’t think I could do it. It took forever for me to get my style down. It’s called Henry and Bea and comes out fall 2019. I should have just had Aaron illustrate that one too. It would have saved me a lot of time! LA: I have a couple of Vincents in my family, but it’s not a name you see often. How’d you choose it? JX—Vincent is a great name! It was the name of our very beloved cat who was really more like a first child for us as a couple. 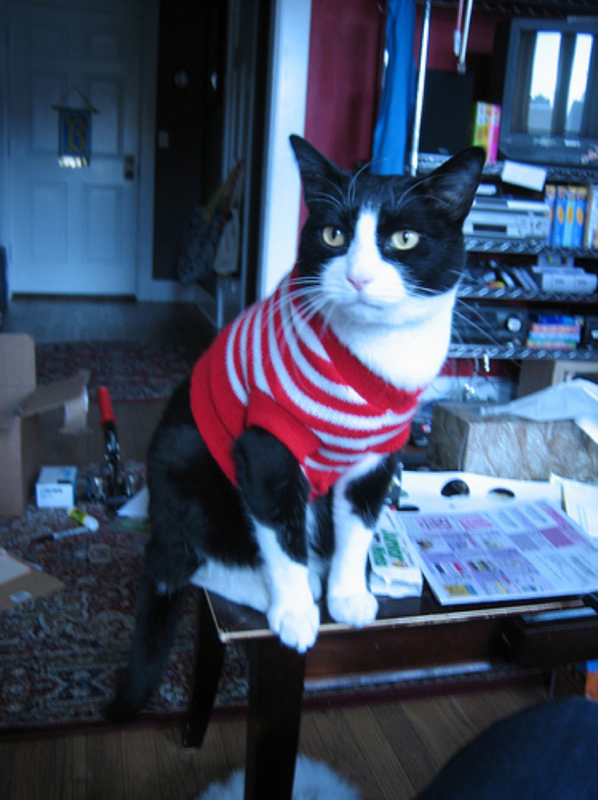 We even occasionally dressed him in sweaters and Halloween Costumes. Yes, we were those people. Most people assume he’s named after Vincent Van Gogh because we are artists, but I actually named him after Vincent Price! AARON—Even though our son’s name is Baxter I constantly call him “Vincent” by accident! LA: The ending of Vincent made me choke up (as did Boats for Papa). Both books (and Before I Leave as well) explore ideas of home, family and longing. Tell us about that. JX—I grew up with divorced parents from a young age, so day to day, my mom was raising me while my dad lived on the other side of the country. My father also passed away when I was 17. So absence has always been a part of my life. The feelings that go along with absence and loss shape you as a person so it’s very natural that those themes frequently come up for me in my storytelling. I will probably forever be trying to understand those themes. AARON—We both moved around a lot as children, college students, and as a couple. It was clear after living together that home is wherever we happen to be as long as we are together. LA: Speaking of home, your bio mentions living in a castle in the sky in Seattle. Sounds magical. Can you share any photos of your workspace? AARON—Our apartment has a panoramic view of Seattle. It’s impossible to work anywhere else other than the dining room table because the view is so inspiring. There is a lot of movement outside our window (seaplanes, traffic, people walking dogs, murders of crows flying overhead, cyclists, clouds, birds, buses, neighbors, etc. ), so it’s wonderful to pause and observe when stuck on a drawing or painting. LA: All of your books to date have been published by Neal Porter. How did that collaboration come about? And do you expect to continue that relationship in his new home at Holiday House? JX—I was lucky enough to be connected with Neal by my agent Alexandra Penfold. After meeting Alex at the New York SCBWI Conference 2013, she offered me representation and quickly sent Boats for Papa out for submission. Neal was interested in the book right away. I first talked to him when I was driving down to Portland a few days after our cat had died. Aaron and I were trying to have a grief getaway and I had scheduled a call with Neal to talk about the book. We had to pull over in a random town so I could take call in the car. Right from the start he was so kind and giving and fully appreciative of my vision. He didn’t want to change hardly anything—something that I was so grateful for. It showed he really I feel like whether you believe in fate or destiny or serendipity or whatever you want to call it, something special brought us together. He is more than an editor and publisher, he’s a friend. He doesn’t just care about our working relationship, he cares about my well being and that of my family. I feel so lucky, humbled, and grateful to work with him and know him. And fortunately, he likes working with me too! We are currently working on a couple of projects for Holiday House. I’m so excited for this new chapter! LA: What’s up next for the two of you? JX—Well I think we are at least working on one maybe two projects? 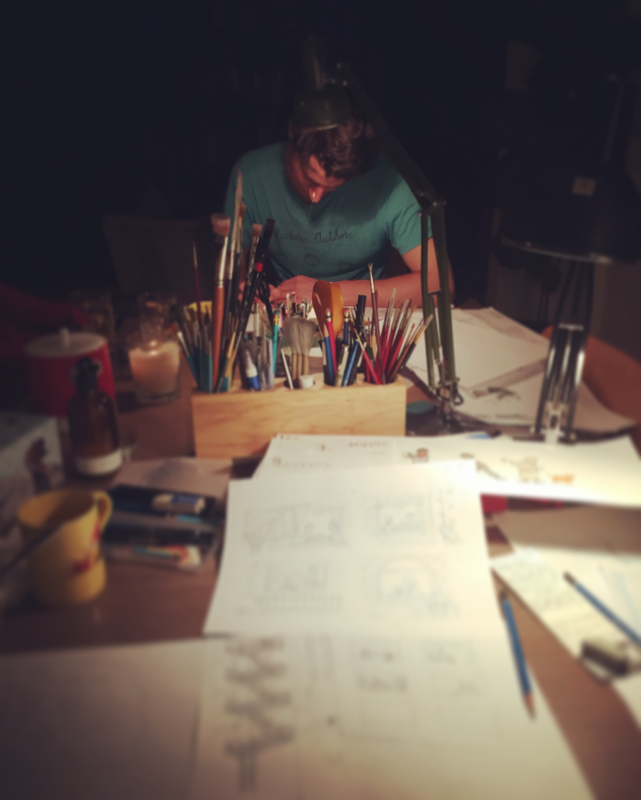 I think there are others too… For sure we are working on a graphic novel together. It’s in the early stages, but we both independently have our own projects going on, so it’s a bit of a tennis match between things. I’m working on illustrating a chapter book for Chronicle A Girl, A Racoon, and the Midnight Moon, written by Karen Romano Young. I’m also in the early stages of working on a couple of picture books, and thinking about five other books I want to do! Needless to say I’ve got a lot of projects simmering on the stove. AARON—For quite some time I’ve been chronicling my dreams in comic form. Seattlereviewofbooks.com has been publishing them online. I’ve picked up where I left off a couple years ago and plan to continue working indefinitely on this project. As long as I keep dreaming I’ll always have content! 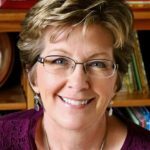 LA: Best advice for aspiring picture book writers/illustrators? JX—From my experience the most important things are: Be yourself, find your voice, and LOVE what you are doing so you never give up. It’s so easy to try and be someone you are not because you think that is what will get your book sold. But it’s the opposite. You are the only you out there and the world needs your voice, not another version of someone else’s. Kids especially can sniff out a fraud. It’s scary but it’s the only way to really make work that is worth the paper it’s on. Be brave. Be you and others will connect to what you are doing. And if you don’t really love writing or illustrating, you aren’t going to make it. It’s a hard business because it requires a lot of work. You won’t be able to fight for it if you don’t really love it and then you’ll just end up disappointed. And if you love what you are doing, you will be happy even if you don’t achieve the success that you hope to have. The moment things changed for me was when I realized that I might never make it. I might never get published. Then I asked myself, if I never got published would I keep trying to make stories and books—without hesitation I said yes. Shortly after I got an agent and sold my first book. LA: Any additional advice for people who want to collaborate with a friend, partner or family member—and maintain a happy, healthy relationship? JX—Have a sense of humor and be open to change and criticism. Try not to get defensive—even if your partner is totally wrong. Ha ha. AARON—Sense of humor definitely. Be patient. Collaboration takes longer most of the time, but the results can be better than anything one person can create. Hang in there even if it’s pretty awful at first. LA: Excellent advice. Thank you, Jessixa and Aaron! For a chance to win a copy of Vincent Comes Home, signed by Jessixa and Aaron, leave a comment below by October 10th. I’ll announce the winner in my next post, October 16, 2018. Aaron Bagley, Jessixa Bagley, Linda Ashman, Neal Porter, Vincent Comes Home. Bookmark. Loved hearing about how you work together, and will definitely check out Vincent Comes Home! I LOVED VIncent Comes Home. Thanks so much for this personal article. I love knowing more about Jessixa and Aaron. It’s special to have such a close creative and personal relationship and environment in which to create. Can’t wait to read your book and enjoy the illustrations first hand. Thanks for the reminder to be brave and be true. Looking forward to reading this and basking in the illustrations. Wow! This sounds like a must-have book! My grandkids will love it! That is so cool that you guys have this kind of relationship – working and personal. I think that is very rare. I admire you both immensely. What a unique and special collaboration. So happy you found each other and can share your love of creating books for children. What a lovely interview! Thanks so much. We are looking forward to having Jessixa come to our Iowa SCBWI retreat in 2019. Looking forward to reading about Vincent! Thanks for this great interview and words of wisdom. I love learning about different ways authors and illustrators approach their work. A great and interesting interview! I have been in awe of couples who can work together and still keep their relationship strong. Kudos to them! Thanks for the insight into the working relationship of Jessica and Aaron. Vincent Comes Home looks wonderful and full of heart! Yes, but fair warning – it’s very distracting! Love the way their words and work resonate with one another and the world! Beautiful story and illustrations, thanks for sharing. When I borrowed Vincent Comes Home from my library, I really felt I had found a treasure. I loved stepping into Vincent’s world. Thanks for sharing. The cover and illustrations look incredible, and I love the delightful cat! Thanks for letting us get glimpse of your world. 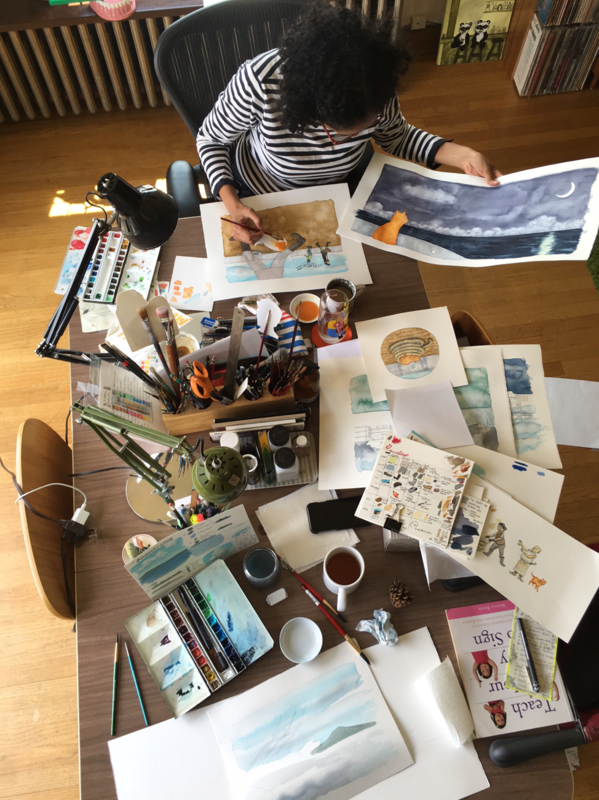 So much of what we do is collaboration in picture books — thanks for the inspiration and insights Jessixa and Aaron. I loved BOATS FOR PAPA and will put this one on my list. Congratulations on creating this heartfelt story! Thank you. Loved the interview, can’t wait to read this Vincent book! Thank you for the wonderful behind-the-scenes look at your work! What a delightful post! Vincent is adorable! I ADORE Vincent (and Boats for Papa, Before I leave, Laundry Day!). Thanks for the great interview and peak into your process and partnership. Can’t wait to see more! This sounds wonderful! And thanks for sharing your story! Books with animals are so much fun. Thanks for the interview today and sharing your process. Thanks for such an inspiring post! Congrats on the new book. Interesting to hear about your collaboration! Thanks for sharing! I checked this book out from the library and loved it! Love the kitty! Love that both of you are from my Pacific Northwest! We are nearly neighbors, if the mountains were not between us! Congratulations! What a wonderful partnership you share. I’m looking forward to reading Vincent Comes Home. This is so fascinating! Thanks, Linda, for the interview. Love hearing about and seeing the collaboration. Thanks for sharing! I love seeing the photos of your workspace! This is such a fun interview! Love hearing about (and seeing) your creative process! VINCENT looks wonderful. Congrats! Thanks for a great post! I can’t wait to read this book. This looks lovely! Thanks for the sneak peek behind the scenes! I always love learning about the creation of #PBs, especially today’s interview! I chuckled when I read about your views – I can see the NYC skyline from the dining room table & love to work there, too! This book looks wonderful. I hope you do many more together. I loved this interview so much esp. since I’ve loved Jessixa’s books. The pictures are great too. I laughed about getting Vincent and Baxter mixed up. It happens to me too. Would love to win Vincent! Thank you Linda. Can’t wait to pick this one up! Big fan! It looks like a perfect book for my toddler! I love the cat on the cover! Great interview, and from what it sounds like – a great partnership in work and life! I love books by Jessixa Bagley, and I can’t wait for Vincent. It was so interesting to read about how Jessixa and Aaron work together. It’s nice their styles mesh together so well. I enjoyed reading this post and learning more about Aaron and Jessixa. Thank you for the inspiring words, “Be yourself, find your voice, and LOVE what you are doing so you never give up.” These words of wisdom can apply to life in general. Thank you so much for this interview. Vincent Comes Home became my favorite book and my mentor text a few months ago. It has so much heart and says so much with so few words. Thanks for sharing the background on this charming book, Jessixa and Aaron, and the peek at your work space and source of inspiration. Oddly enough, my daughter had a cat named Baxter who looked very similar to your Vincent. A wonderful and inspiring post. Thank you!